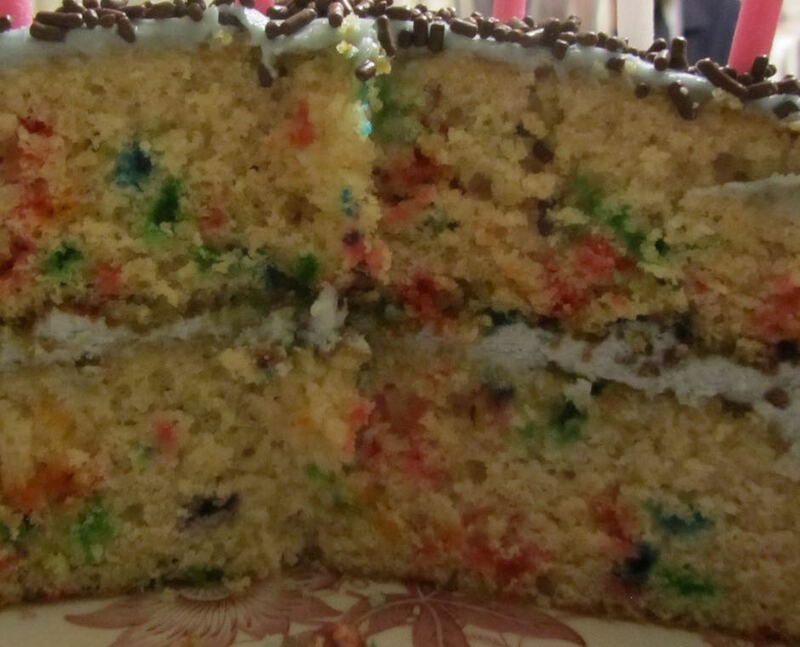 My cost for the cake portion, including eggs and butter, was about $1 for this funfetti cake. I used this butter cake recipe for the batter base. 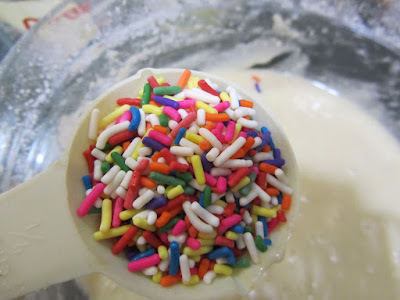 After the batter was blended together, I used a rubber spatula to fold in 1/3 cup of rainbow sprinkles. (I bolded the "fold in" part on purpose. If you use a mixer at this point you'll break the rainbow bits up and it won't look so nice.) That's all it takes. For a batch of batter that makes 2 8-inch layers, you need about 1/3 cup of sprinkles. The batter looks sparsely populated with rainbow bits before it is baked. 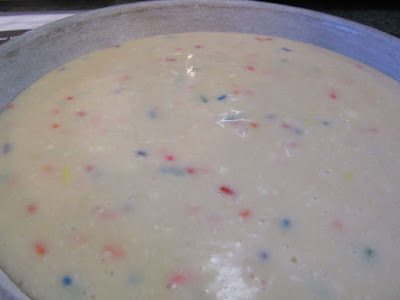 During baking the sprinkles all "explode" and give much more color to the cake. The cake could have been about 40 cents cheaper if I had subbed margarine for the butter, but I happen to really like the flavor that butter adds to a vanilla cake. So I went with the real deal. I bought the rainbow sprinkles at Win Co in the bulk section. 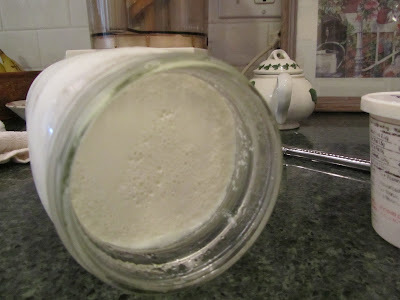 Much less expensive to buy them from bulk bins than in small containers in the baking section. Thanks for that reminder. We did buy those sprinkles from DT several years ago, and thought they were fine. The container works out to be about $3.50/lb, which is close to what I paid in the bulk bins (I don't recall the exact amount). Anyway, buying from bulk bins or at Dollar Tree are both much more affordable than in a traditional grocery store baking section. Thanks for pointing to Dollar Tree as a place to buy the sprinkles. Speaking of cakes, I recently made one and forgot to put in the vanilla and it was horrible. Who knew that one little ingredient would be so important. Wow, really. Who knew that one little ingredient could make such a difference. Sorry about the cake mishap. I hope you salvaged it somehow. We managed to eat it, but it could have been so much better. The sprinkles make the cake so festive. It looks delicious too. Winco's bulk bins are the absolute best! It does look festive, doesn't it? One of my daughters really loves the funfetti cakes, so I let her determine the interior of the twin-shared birthday cake. The other daughter had the final say in the exterior of the cake. 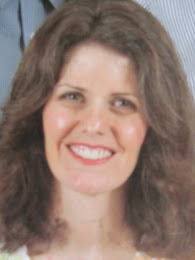 Have a great day, Mary! Over the years I have tried to make the cake special to each of them. Some years I made individual miniature cakes, each one tailored to each's unique likes. Other years, I just did a mash-up of their likes on one cake. And then, like this year, one gets to determine what's on the inside and the other, what's on the outside. I shared a birthday with a family member and remember a couple of birthdays where it felt like my share of the birthday was just barely acknowledged. And I never wanted either of my daughters to feel like that. So, this year's cake didn't exactly look congruent between inside and outside. But what does that matter -- it tasted good, and both daughters felt honored on their day. Hope you and your family had a great weekend, Kris! Thanks. It's fun to do something special for your own kids, isn't it? Have a wonderful day, Belinda! I'll have to try those hard round sprinkles in a cake, sometime. That's good to know that they work in an angel food cake. What a lovely memory of the family friend's gift to you each year. I'm glad that you found a way to replicate it. I hope that your week is off to a great start, Sara! That is a very pretty cake. I used to make special cakes for my kids' birthday and even bought a book on simple cakes for kids. I no longer make cakes for birthdays mostly because they are not around for their birthdays anymore. I don't even know if I have that book anymore since we moved and purged too much 5 years ago. But now we have the internet to give us ideas if I ever need a cake. You're right, there are so many cute and fun ideas for celebrations online. I think this extends to regular cookbooks, too. I'm not sure very many young brides even have cookbooks in their kitchens. Even in my generation, if I need a recipe for something I've never made before, I check online before my own collection of cookbooks. It's just more convenient. My mom had a birthday and celebrations cookbook, with pictures of kids' birthday cakes. I have that now, and looking through it brings back so many pleasant memories of my childhood.